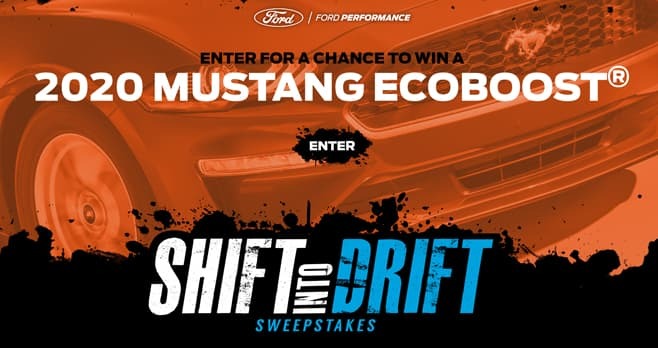 Ford Shift Into Drift Sweepstakes (ShiftIntoDrift.com): Here is your chance to drive home a brand new 2020 Ford Mustang EcoBoost Fastback with Performance Package valued at $40,000. For your chance to win this amazing sport car, visit shiftintodrift.com and register for the Sweepstakes by October 19, 2019. The Ford Shift Into Drift Sweepstakes is open only to legal residents of the forty-eight (48) contiguous United States and the District of Columbia who are licensed drivers and are at least eighteen (18) years old at the time of entry beginning April 4, 2019. The Sweepstakes begins on April 4, 2019 at 12:01 p.m. PST and ends on October 19, 2019 at 11:59 p.m. PST. One entry into the Sweepstakes per person is allowed. The grand prize consists of a 2020 Ford Mustang EcoBoost Fastback with Performance Package. Visit www.shiftintodrift.com to enter and see Official Rules for details.